When I started this recipe, I was amazed at how easy it is to make homemade whipped cream. At its most basic level it is only 3 ingredients, which is so easy! All you need is Heavy Whipping Cream, Sugar, and a great Vanilla Extract. Then you just whip all of these together with a hand-mixer, and you are all done in less than 5 minutes! Since it is so simple to make, I started thinking up ways to spice up whipped cream even more! If you didn't know, we just added a new line of syrups to our online store, so I thought, "Can I make pink whipped cream with a strawberry syrup?" Well, the answer is a resounding YES! You just add in the strawberry syrup instead of the sugar right before you whip up all of your ingredients, and PRESTO you get pink homemade whipped cream that is strawberry flavored! All you do is just whip all the ingredients together until you get stiff peaks, and then it is ready to go! 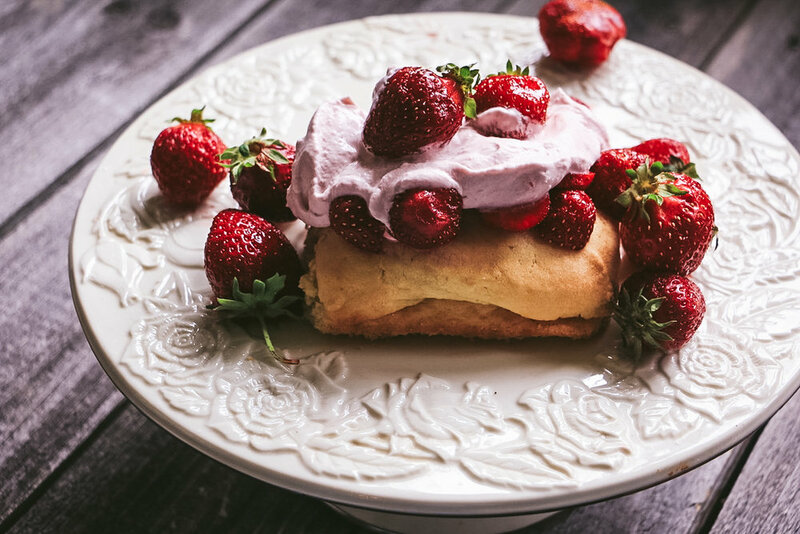 So, yeah this is my new favorite way to serve strawberry shortcake, because it doubles the amount of strawberries that I am adding to my dish!